Board of Revenue BOR Quetta Balochistan Jobs March 2019 is offered by the organization of Balochistan JobsBoard of Revenue Quetta Balochistan JobsBOR Quetta Balochistan JobsDawn Newspaper JobsJang Newspaper JobsQuetta Jobs. The Working hours for Board of Revenue BOR Quetta Balochistan Jobs March 2019 is 8 hours a day and 40 hours a week. 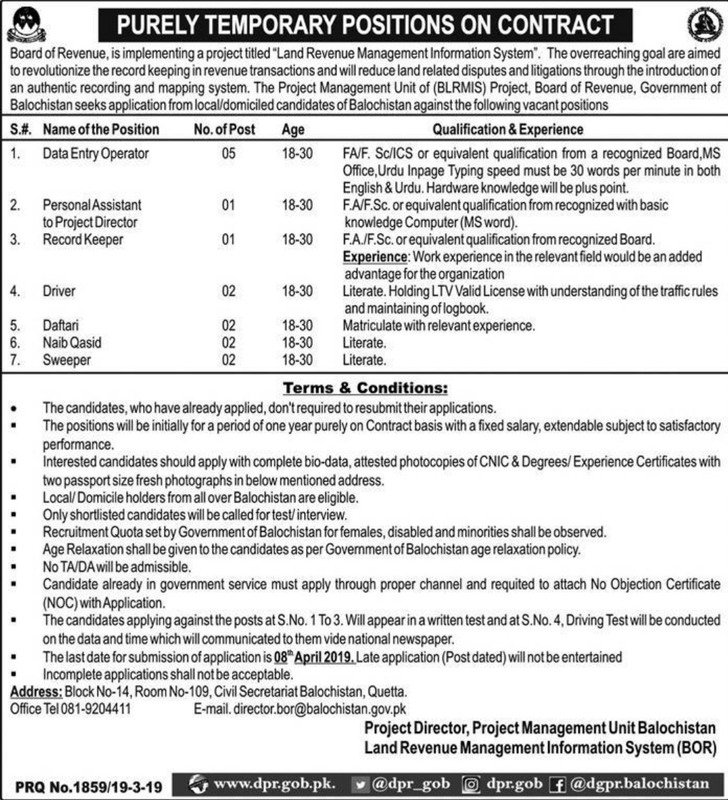 So, Board of Revenue BOR Quetta Balochistan Jobs March 2019 is a fulltime job. 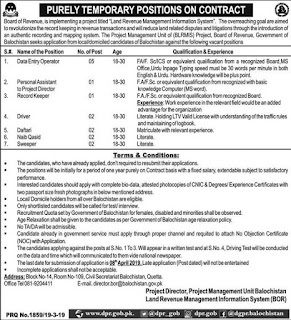 The advertisement of Board of Revenue BOR Quetta Balochistan Jobs March 2019 contains complete information about job specifications, job description etc. which is published in Different Newspapers dated March 20, 2019. To find at this page Board of Revenue BOR Quetta Balochistan Jobs March 2019, you must carefully read all instructions. The positions of Data Entry Operator, Personal Assistant to Project Director, Record Keeper, Driver, Daftri, Naib Qasid, Sweeper are vacant. The persons who intend to apply may submit their applications as per guidelines laid down in the job advertisement. The last date to submit applications is 8th April 2019.